So, um xD, I guess I should tell you somethings about myself? Last edited by Karina♥'; 11-14-2011 at 10:49 PM..
Click here for the Forum Rules! Front Page News is where you can put discussions on the front page news, like new updates in BAVB. General Discussion is where you can talk about stuff related to BearVille! BearVilleInsider Contests! is where you can enter or make your own contest! Like seasonal banners, etc. Yikes! I need help!! is where you can post questions. Kinda like CyBearGuides, but other people answer this. 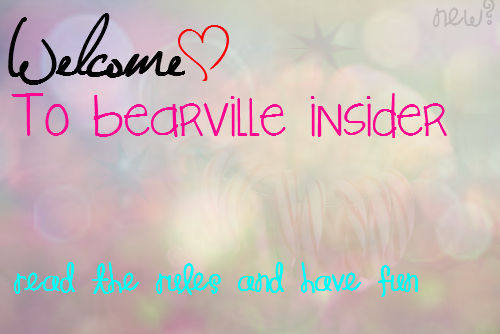 Beginners Guide to Buildabearville is a place where there are people to show you around in BAVB! I recommend that for all new people in BAVB. Looking for Special Guest! Like the famous people in BAVB, (Maxine, Miguel Sunshine, CholeRocks, Green Tracks) You can chat with people and maybe they'll know where they are if they're online! Special Events is where people talk about new stuff in Build a bear. New bears, new areas, and lots more updates to imform you! Codes is a great place for sharing codes you don't know or never heard of. People might give codes, but some codes can not be shared, such as reciept codes. Whoopsies! is where you can post glitches, and people will tell you why it happened or if it did to them. Bearemy's Giveaways is where you can post if there is a Bearemy prize! Quests and Challenges is a place where you can ask people how to do a quest or help people with it. Team Play is where you could make a team or join a team. Role Play is where you can make a play or join a play. Pawty Time is where you can host your own party! Beary Fashionable is where you can show off your BABV fashions! Beary Musical is where you can post your own song you made up or like or like a musical play. Beary Creative is where you can show stories, signatures, avatars, and other stuff you made! Cub Condos is where you can show your Cub Condo if it has a special theme! Polls is where you can vote or make your own poll about something in BABV. Coffee House is where you can talk what's going on the outside BABV world! Virtual Gaming Outside BABV is where you can post about games you play outside BABV! The Birthday Place is a place where you can tell the whole BI if your Birthday is coming up or if it is! Join the Club is where you can make your own club or join one, such as a fan club! Are You Game? is a place where you can play a lot of games and share games! You can even make your own game! Links is where you can post links about another place outside BABV! Hey there! Welcome to BI. Hi Karina! Welcome to BI! Welcome to BI... If you have any questions check out the FAQ and don't be afraid to VM me or anyone else~we all love to help, as far as i know xD - VM means visitor message. Sage bear-You have to be a Trading Teddy that has had more than 30 successful trades.